To thaw pipes with direct heat, find the spot where the pipe is frozen, and apply heat directly to that area. Examples of a direct heat source would be a hair dryer, a heat gun like the kind used for paint removal, or a propane torch. Note: A torch with an open flame should never be used on PEX piping or PVC. Never use a torch directly on the joints of copper pipe. You can melt the solder and cause leaks. Copper is a good conductor of heat. If you're 12 inches away from the joint, you're close enough to clear ice in the joint. When thawing pipes, you're often working in tight spots. If you use an open flame for thawing, don't set your house on fire dealing with frozen pipes. This is probably the easiest method of thawing frozen pipes. If your frozen pipe is indoors, simply raise the temperature in the room with a space heater. If the frozen pipe is under a sink, place the space heater near the area with the door open. Check the plumbing periodically to see if the heater defrosted the pipes. For larger problems, their are “bullet heaters” that run on kerosene, and now similar units that run on propane. The units come with a hose that can be attached to either 20, 40, or 100 pound cylinders. They produce from 30 to 85 thousand BTUs, depending on the size of the unit. When using these types of heaters, the biggest risk is carbon monoxide. Stay safe! Follow the ventilation guidelines on your heater. Better to go without water than to get asphyxiated. 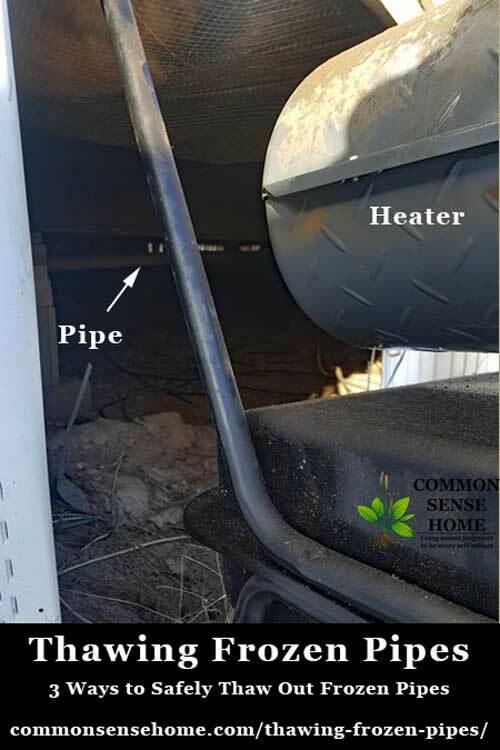 If the frozen pipes are under a trailer house, tenting the heater to direct the heat to that area must be done using non flammable materials. Keep a safe distance from flammable materials. Again, follow the manufacturer's recommendations for your specific portable heater. Space heaters cause fires every year and should be monitored during use. Keep a fire extinguisher handy for emergencies, just in case. 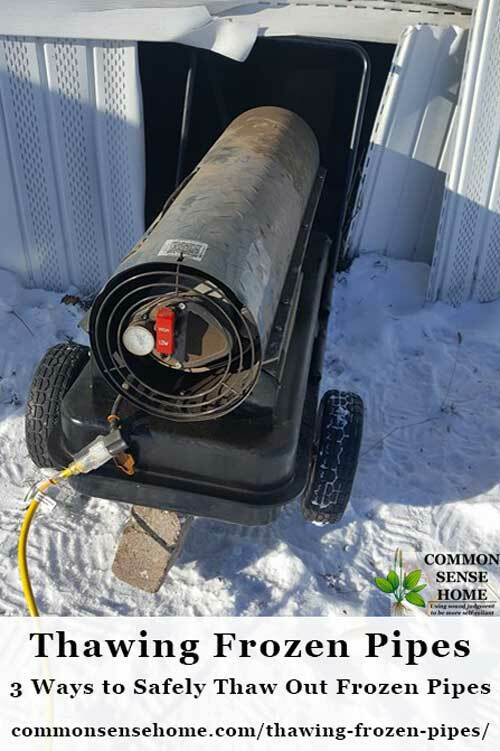 Professionals use steam machines to thaw frozen sewer lines, but for a small job you can build a unit that works on the same principal with a small pump from an aquarium or something similar. The video below illustrates the process. Warm water would work faster, but any water pumped into the frozen line will melt ice and clear the blockage. Note: Once the line is thawed, run a small stream of water to prevent it freezing again. If dealing with a frozen drain pipe, check it the trap first. The rest of the pipe should be empty. If it's not, the drain's not working correctly. For example, over time, support brackets can come lose, causing a sag in the drain line. This holds extra water that can freeze. This happened to a friend last year with the PVC drain line for a washing machine. The vibration of the machine caused the line to slide in the clamp. Once you get some heat on the trap, you can take it apart and clean it and get the rest of the ice out. Carefully reinstall the trap and check for leaks. 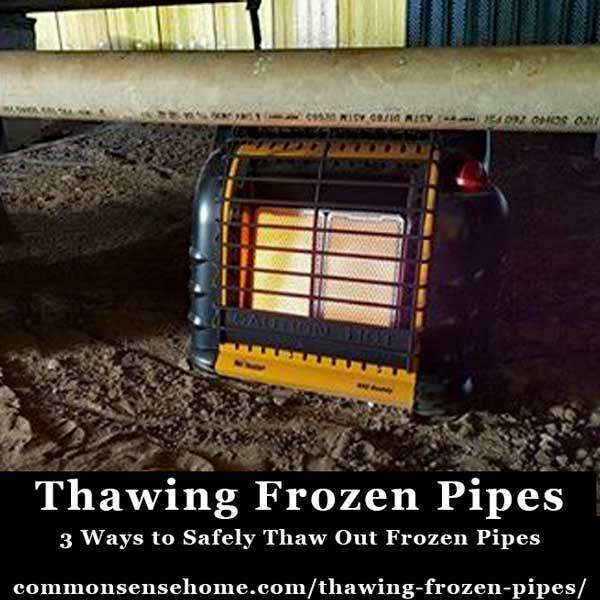 Thawing the frozen pipe may be the first step in solving your problem. When water freezes, it expands. This expansion can crack plumbing lines causing water damage. Before you start working on your pipes, make sure you know where the shut offs are for your house, including the main shutoff where the water comes in. This will allow you to minimize the damage if you have a leak. Temporary repairs in drain pipes can be made with high quality tape such as Flexseal. This will hold you over until you can get them properly fixed. Water lines under pressure need to be addressed differently. Cut the pipe on both side of the leak, go to the store and get some hose large enough to fit over the pipe and hose clamps. Slide the hose over the line several inches at each end (connecting across the damaged span). Secure the hose in place with hose clamps. This is not a permanent fix, but it will get you by in an emergency. Turn off the water before you go to work or to bed – whenever you leave the area unsupervised. Sometimes pipe patches do leak, so it's better to be cautious than to come back to a mess. If you have a leak inside a wall, don't be afraid to remove the sheet rock and attempt to repair it. If you hire a professional, he'll have to get to the area of the leak to fix it, too. Getting to the leak sooner rather then later minimizes water damage is worth the risk. Use care and caution, but get the job done. Do the least amount of damage to the space so fixing it will be less expensive. In exceptional cold it is always helpful to open the doors to the area under the sink to allow warm air in to the space, avoiding problems in the first place. Make sure you have plenty of fuel on hand for your preferred heating source going to winter. Use preventative measures such as heat tapes and proper insulation to protect pipes from freezing. There will be another post with more detailed preventative tips coming in the future. 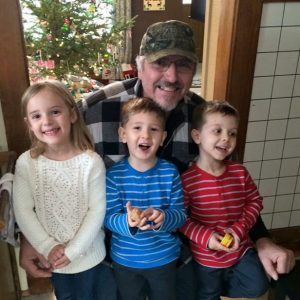 You can get more detailed information in the post, “Prevent Frozen Pipes – Extreme Cold Options, Plus Construction Tips“. Frozen pipes are never expected, but having some knowledge can make the repair process less painful and costly. Repairing plumbing in extreme weather is very difficult and prevention is a better approach. Great information! Our water pipes come in through the laundry room. On super cold nights (below freezing) we keep a small lamp with an incandescent bulb (60-100 watts, depending on the lamp) on overnight for some ambient heat ‘just in case’. Thanks for sharing. A few degrees is often all that’s needed to avoid trouble, and incandescent lights throw off a fair amount of heat. Incandescent lamps are better heaters than lamps. Thank you for this article. I hope I never have the problem, as I take steps to keep my pipes from freezing. I live in the country, with a well for water. I keep a heat lamp on in the pump house for the exposed pipes there. It is a short distance to the house, with all the pipes on the same side of the house. There is an addition for the laundry room, and the pipes there and to the kitchen sink are all exposed. For that, I have a small space heater that is always on after the weather first hits about 30*. It is on low, and I check it regularly when doing laundry. Nothing is ever close to that heater, I keep everything at least a foot away. So far, this has worked for me. I believe that the pipes from the pump house to the house are not buried very deep, and that does concern me, but so far, so good!!! Some day, when I’m filthy rich (ahahah!) I plan to re do the pipes as I think some are original to the 1945 home, and are lead. (YUK!) and fix any issues from uninsulated pipes. Glad you haven’t had any freezing pipes yet (knock on wood). I hope you can find it in the budget to replace the lead pipes sometime soon. It’s crazy how many things end up in regular use and then are later found to be toxic.